As a successful former small businessman, David has created hundreds of jobs and understands the vital role of small businesses in creating private sector jobs and strengthening the economy. He has been recognized twice by West Virginia Executive Magazine as one of the 50 most influential people in West Virginia. From 1981 through 1994, he represented the Third Delegate District in the West Virginia Legislature and in 1990 was elected as Chairman of the West Virginia Republican Party Executive Committee. David was sworn into office on January 3, 2011. 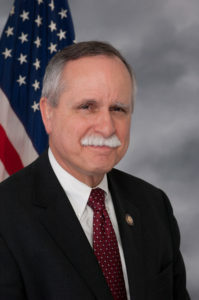 He serves on the House of Representatives’ Energy and Commerce Committee, where he is vice-chairman of the Oversight and Investigations Subcommittee. He knows the coal industry is the backbone of West Virginia’s economy and has worked tirelessly to stop the Obama Administration’s War on Coal. Three times the House has passed his legislation to protect the 316,000 Americans reliant on the coal ash recycling industry. He has worked to protect coal miners’ pensions and healthcare benefits they worked hard to earn. He has fought the onslaught of burdensome regulations coming out of the White House that have crippled the coal industry and threaten our long-term energy security. As an individual with significant hearing impairment and a grandfather to a child with special needs, David McKinley is no stranger to overcoming the obstacles of disabilities. He has used his role on the Committee overseeing health policy, Medicare, and Medicaid to push for better coverage for families and the elderly. David is married to the former Mary Gerkin from New Martinsville, West Virginia and is a proud father of four children and six grandchildren. David is a seventh generation resident of Wheeling and West Virginia. His passion for the families of West Virginia inspires his votes in Congress and he always remembers who he works for.